I called dibs on this followup months and months ago. Back when the teasers for each episode were first released. 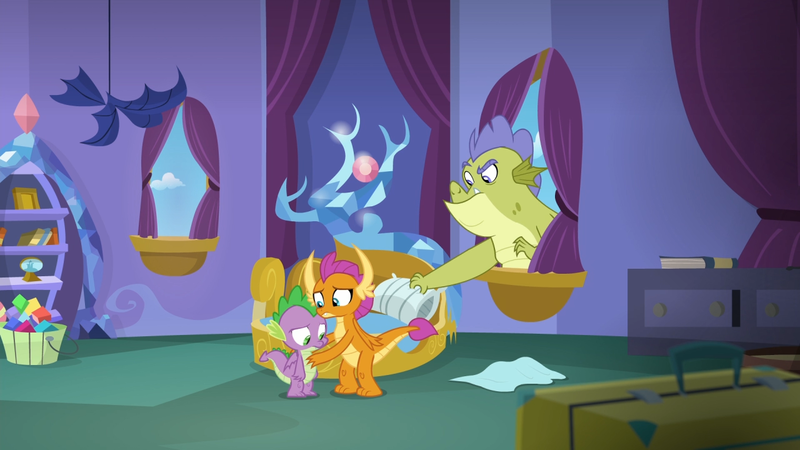 Would we really find out about Spike's family? His life has changed recently, so it wasn't outside the realm of possibility. How's about we start with the most recent change to Spike's life? Flying lessons! 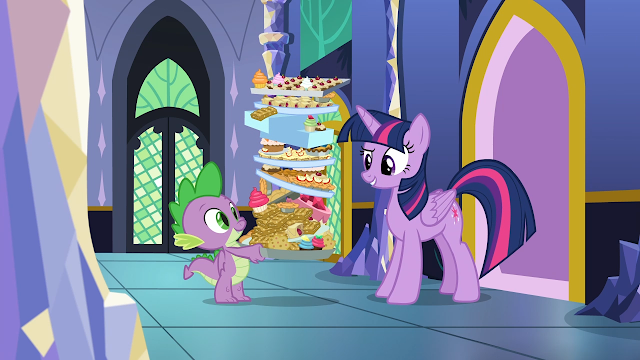 This is a fun next-step for Spike after the recent wing-ification. But even better is his coach. 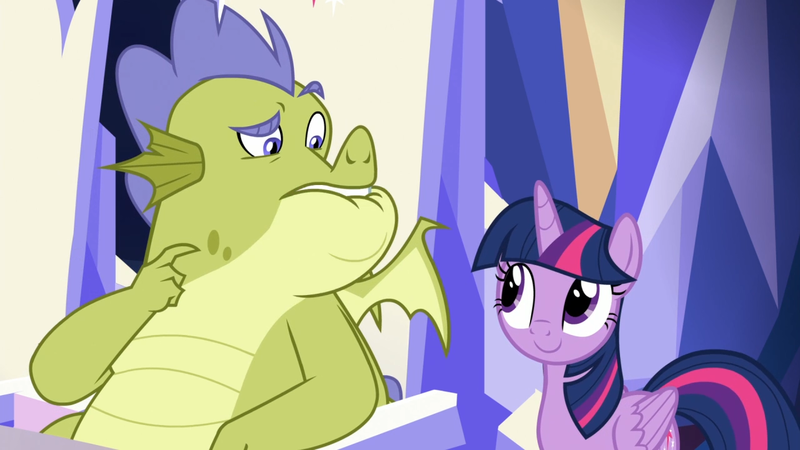 Twilight may not be the best flier, but I can't think of anyone better to encourage him. When Spike said "If I'm gonna mess up, I'd rather do it in front of you", it was a great statement of their trust. 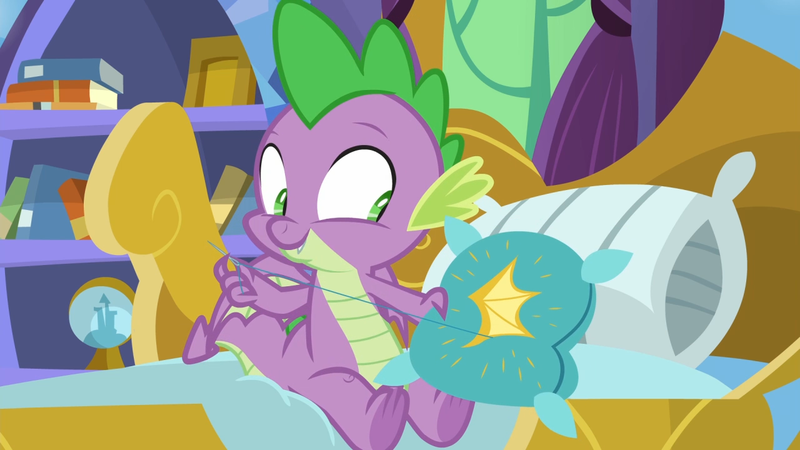 And mess up Spike did. Which leads into the idea of slapstick! 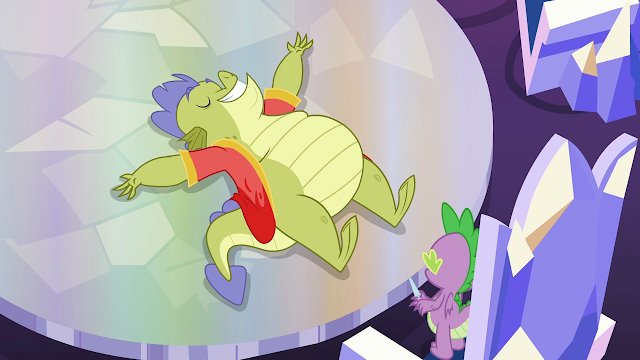 Here's the thing: it's funny to see Spike faceplant because there's the hope that he'll get up and try again. This is different from past slapstick that featured Spike getting hit, launched, or otherwise made a punching bag because the story would cut away and never look back. 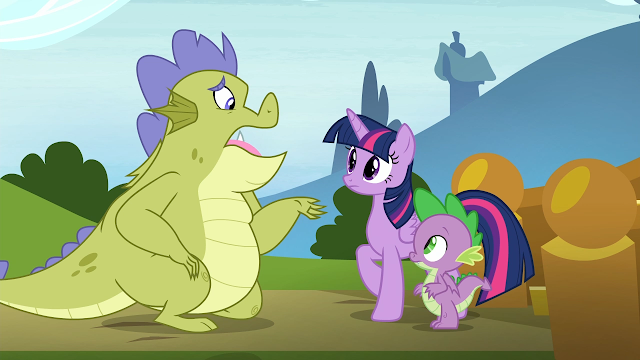 Spike was hard to like in the early seasons due to his running commentary, but later he became more helpful. This changed the dynamic of the slapstick, as he was suddenly being punished for supporting others. Warning! It takes several years to look this nonchalant. Do not try the "too-cool-for-you" tree lean without proper supervision! In fairness, when everyone you know relies on feathers it's understandable that you wouldn't know about this oversight beforehand. 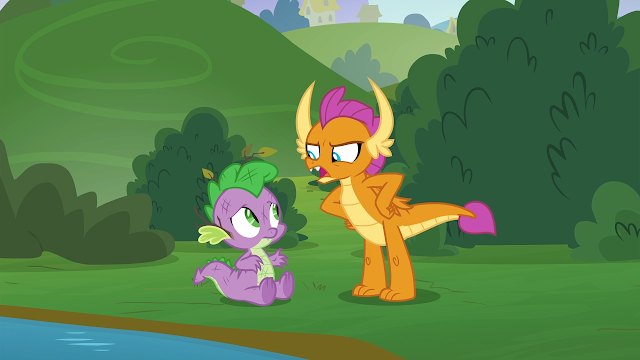 I'm glad Smolder is around to give Spike new perspective. See? 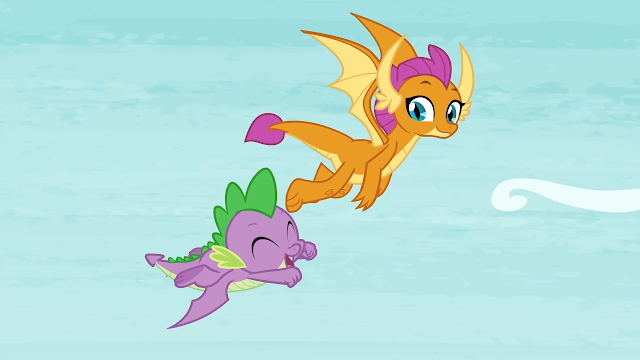 I'm cool with the earlier slapstick because now Spike is literally flying high and loving it! Even adding a little flair to the landing. Marks for style but watch the showboating! 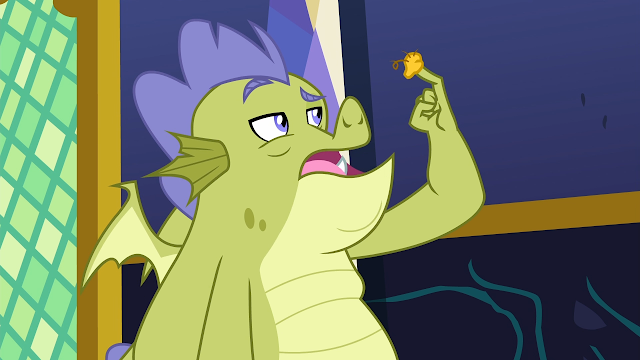 "Honestly, this is Dragon 101. 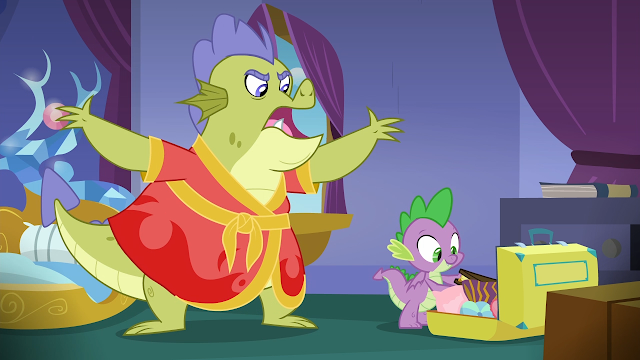 Usually dragon parents teach this stuff." Ah! Smolder! Minus points for sticking your claw in your mouth. Be more chalant! That should be a word. If you have "nonchalant" then there must a chalant out there. That would make me very gruntled. 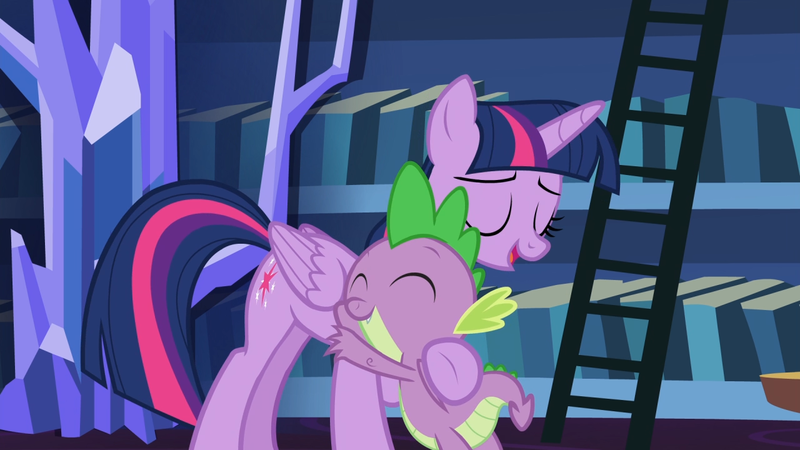 Twilight needn't beat herself up over this. 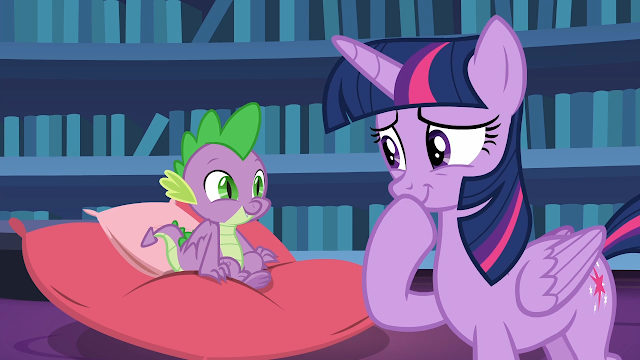 I do wish she'd been more proactive in learning about dragons and passing that knowledge to Spike, but he's grown into his own. She hasn't failed to help him be a kind being. Case in point: thank-you pillow! How many people do that? Little cross-culture information here. I'm reminded of that dragon from Gauntlet of Fire who wanted to raid Equestria for pillows. Methinks the ponies' scaley neighbors would benefit from a gift set. 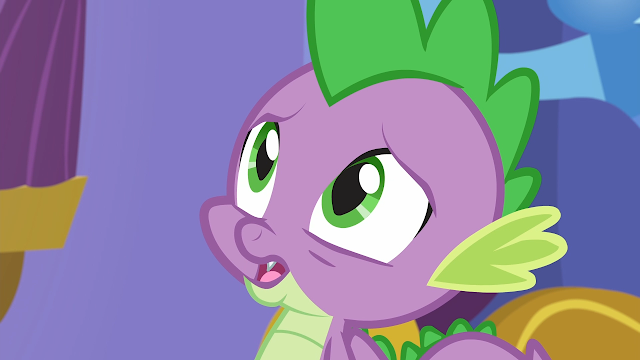 Here's a dark thought: without those flying lessons, Spike very well could have been toast. Like his poor pillow. Ashes to ashes. Fluff to fluff. Ta-da! 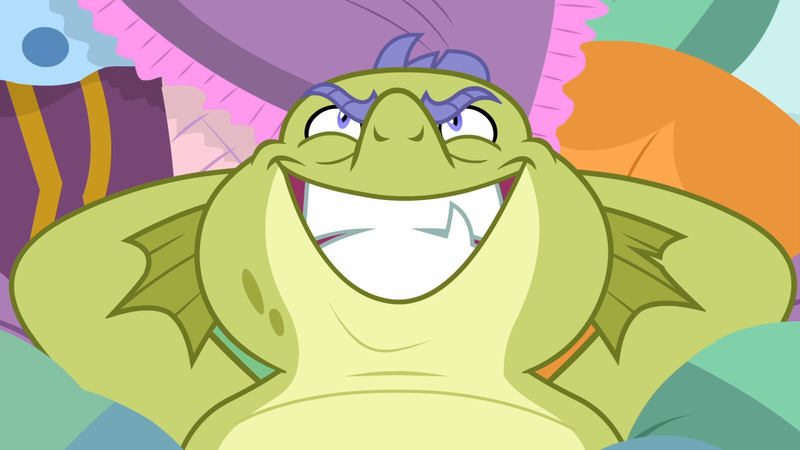 Please welcome our antagonist for this episode... Sludge! 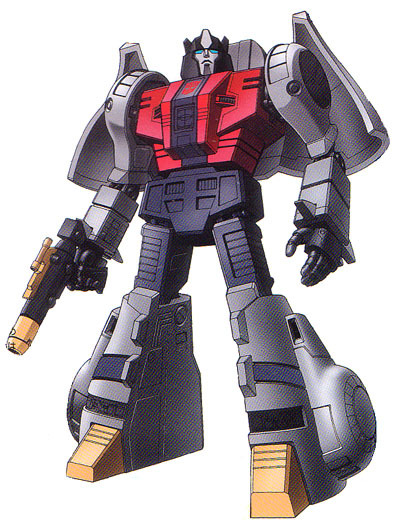 I'm sorry, but right now I'm having Dinobot visions. I'm hardwired this way! 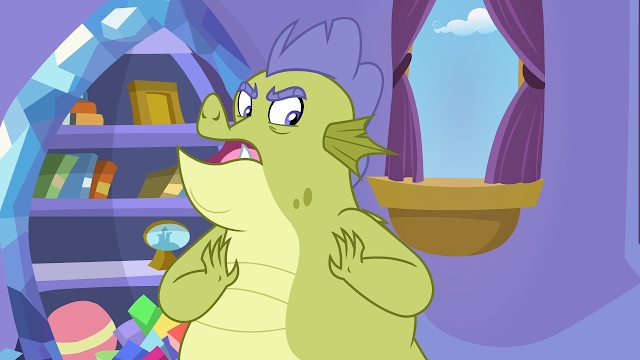 Curse you, Hasbro! Me, Sludge, would make excellent father figure. What you are you looking at, background pegasus? 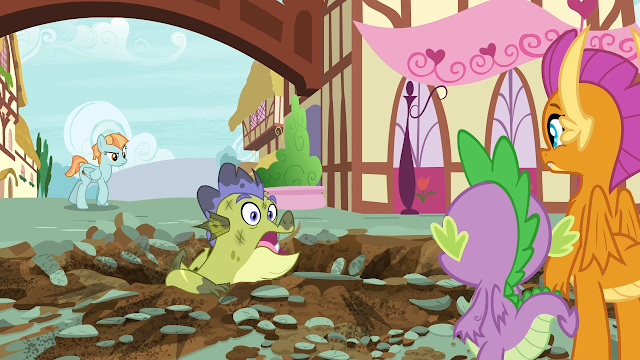 A dragon in a crater in the middle of the street? In Ponyville, they call that a "Monday". Friend of mine: I can't believe they gave his stomach jiggle physics. Me: Why not? Anime girls get that all the time. 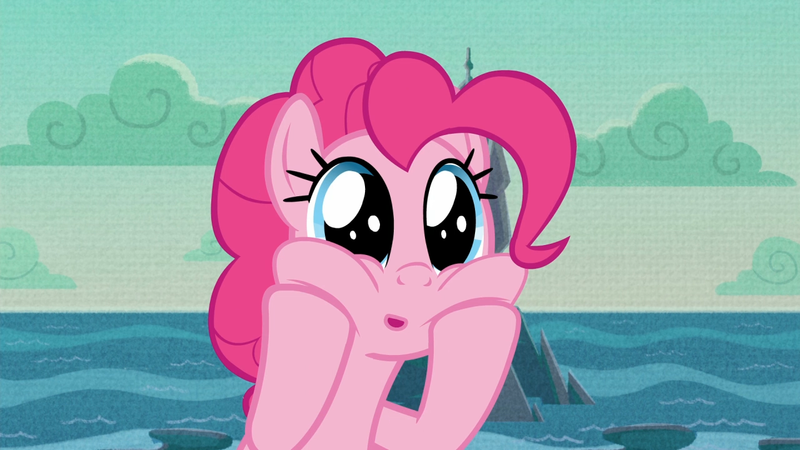 So, let's talk about ponies being awesome. They don't know this guy and yet they're willing to help him recover. Given some of the hesitation we've seen from ponies with other species, that's not something to take for granted. And who could say "no" to all those smiles? Montage of ponies being awesome. Using their individual talents to help Sludge get his strength back. 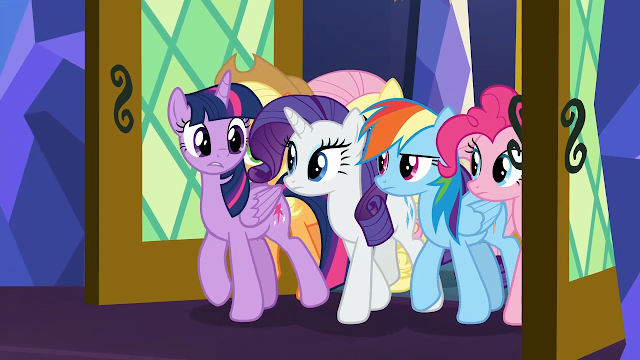 This season hasn't featured the Mane Six bringing their best as teachers, mostly because we're meant to assume they're doing all that off-screen. When I see this, I think of it as an example of the innovation I hope they show to Smolder and the others. Bonus points for Wonderbolt assistance, but hang on! 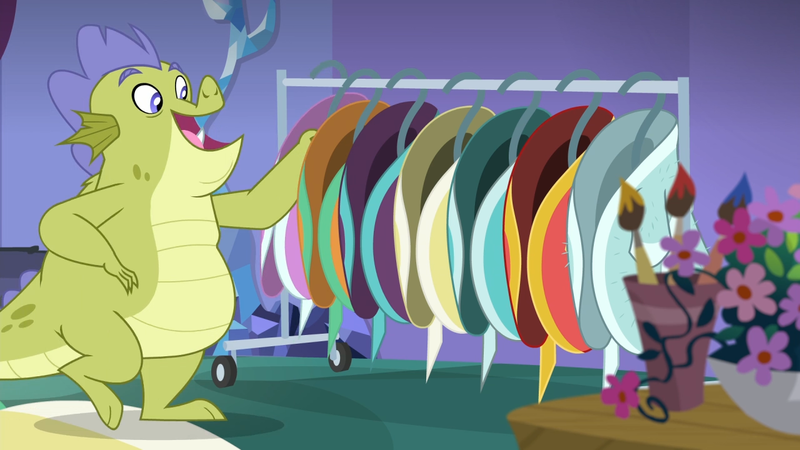 That's Fleetfoot, who could use a little bit more positivity after Rainbow Falls. But that's Blaze helping out. At first, I thought it was Spitfire. I wonder if those two are best buds? 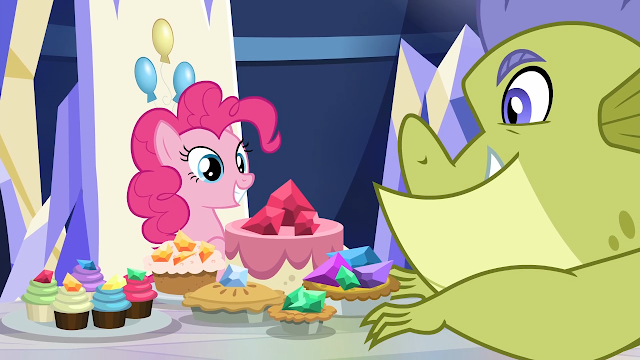 Pinkie gets bonus points and not because it's her celebration day. She seems to understand best how to motivate Sludge. Rainbow and Applejack are fans of effort in their favorite fields, but Pinkie knows the way to Sludge's enthusiasm is via the stomach. There's no reason to include this screenshot other than it's flippin' adorable! 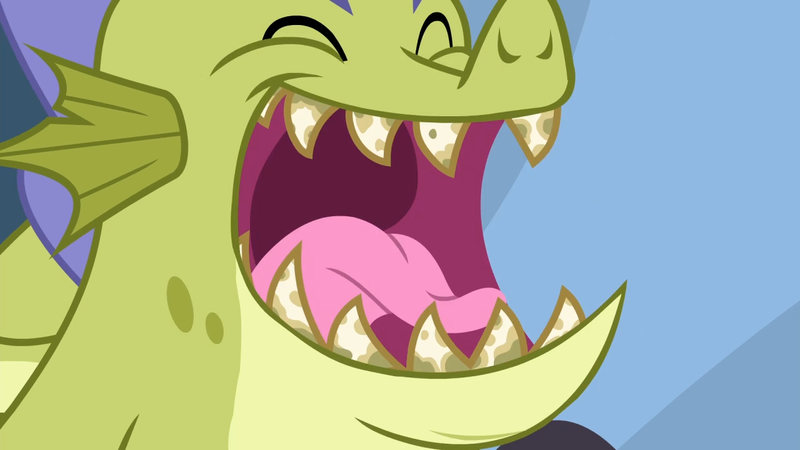 Good grief, look at that maw! No wonder the dude can put away so many treats. I wonder if he's part snake! 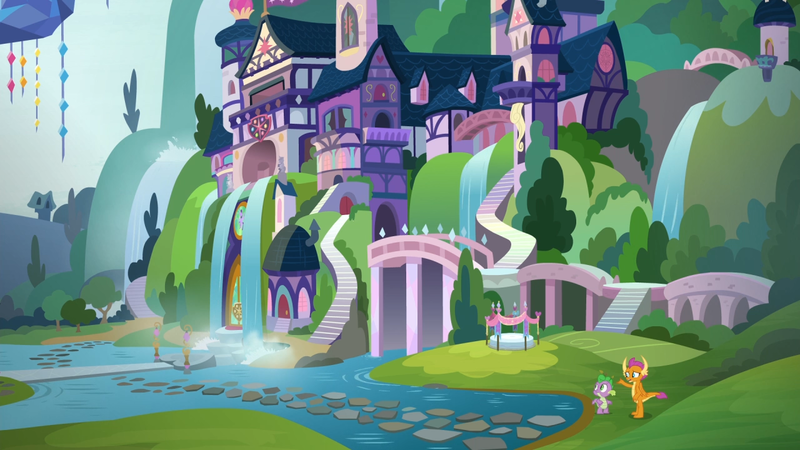 "Coming to Ponyville wasn't an accident. I was looking for you. Spike... I'm your father." 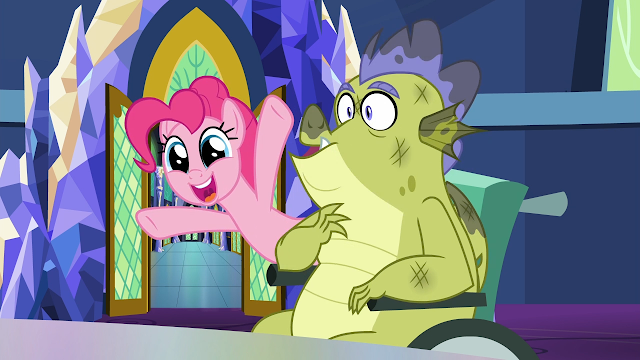 Sorry, Pinkie. After beholding Sludge's maw there's no way you can out-gasp him. "A" for effort! I'm a little surprised at how accepting Spike behaves. I'm thinking of stories like Star Wars or The Magicians where the lead character often had an idealized image of his father. It made it hard for them to accept the reality. 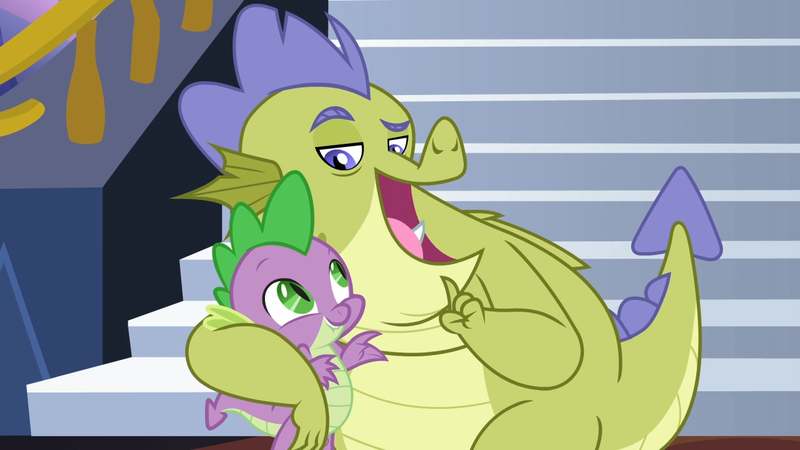 I wonder if Spike has ever fantasized about his parents. Maybe built a narrative around them. As it is, he's being very go-with-the-flow. Oh my goodness! Careful with those puppy eyes! You'll slay someone! Well now, this was a fun surprise. 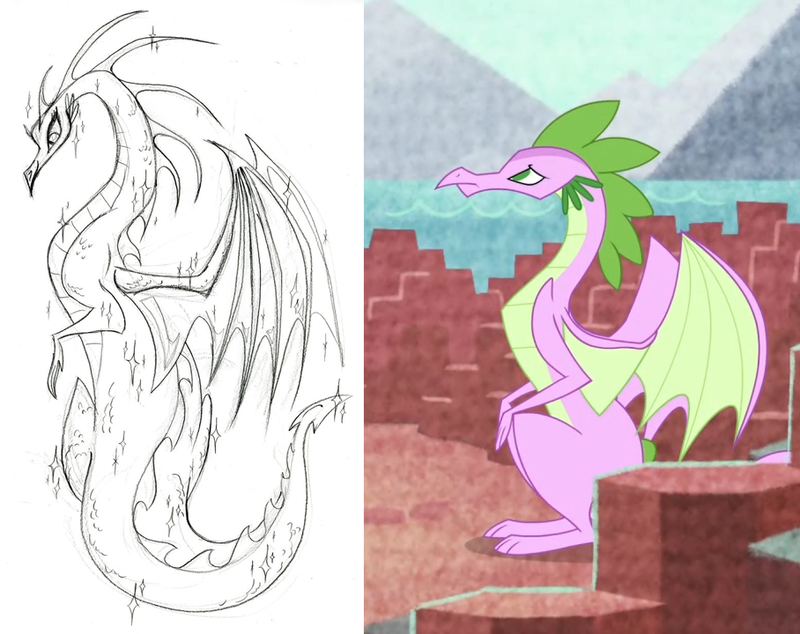 Though modified, I see a lot of Lauren Faust's original concept artwork at play. That's a nice detail that doesn't require a fan to know about it, but knowing makes it even better. But here's where Sludge's story starts to falter. Even if you rule out his earlier gluttony, there are signs of dishonesty. Spike's "mother" is comparable in size to Torch. But suddenly, she's only slightly taller than Sludge. Dude could fit in Torch's palm. Pinkie! Fourth wall breaking is one thing but do not intrude on someone's flashback! Plus, you're being just as dangerous as Spike with those adorable eyes. But oh how I wish this place were real! Well, real within the cartoon and whatnot. It looks so menacing. A tragic tale, but there are multiple holes in Sludge's story. 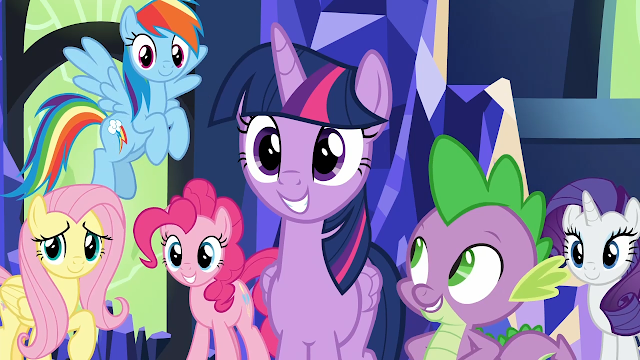 And it's interesting to see how each pony reacts. Rainbow is the most outspoken while everyone else seems silently reserved. 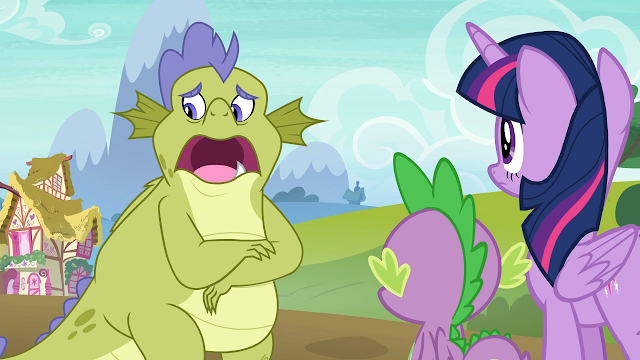 Only Spike is awestruck. If he didn't have a narrative about his father beforehand, he's buying into it now. Again, why is somepony gawking? This isn't even the fifth weirdest thing to happen! Time again for the ponies to show their best! Though they may have doubts, they are really going all-out to help Spike. Can't really fault Sludge for this one. Even Spike thought about throwing away the frilly apron. 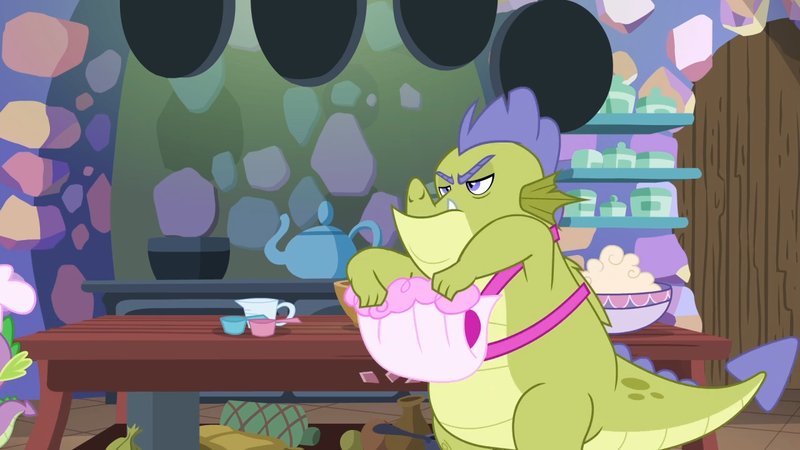 Might want to ask Rarity for a denim apron. But the apron don't matter as long as the treats are yummy. 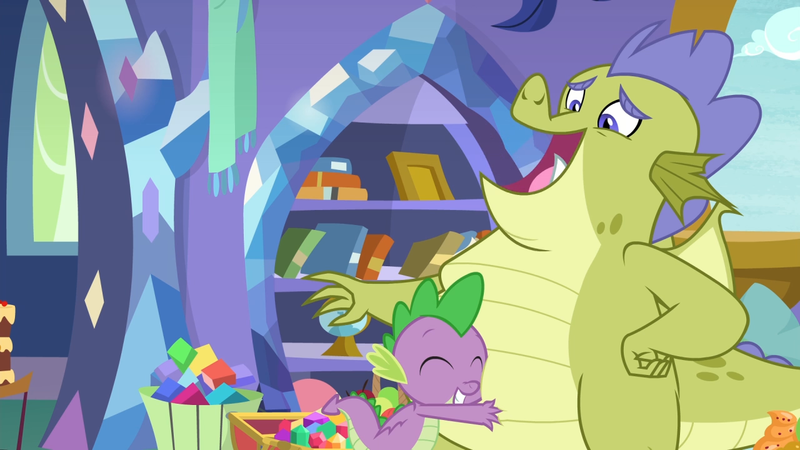 In context, I realize that Sludge's mouth is large enough to eat Spike. 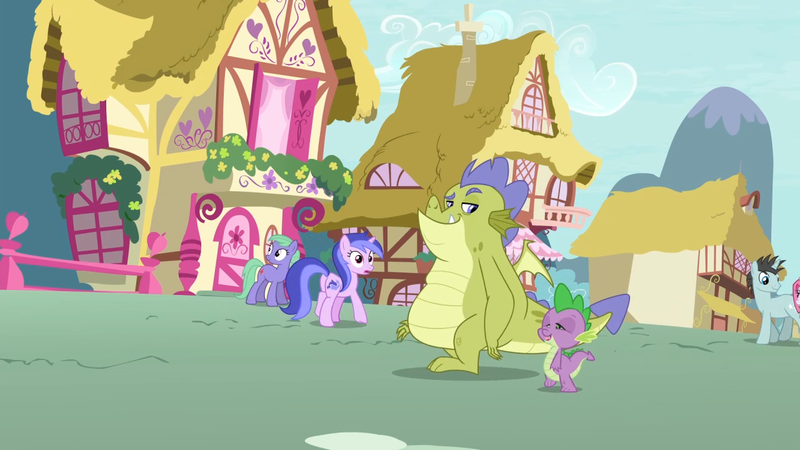 Keep your distance, little dragon! This "not really" moment cemented it for me. This isn't even a guy I can love to hate. This is just cruel. And how can you be cruel to a face like that? I don't know where Twilight stands at this point. She likely has doubts but her affection for Spike is still the deciding factor. And here's the thing: Sludge may be a phony but he could have made a choice. Start out with a scam, but grow to love the role. Spike's had bad luck with dragon culture. Most of his interactions have been with Garble & co. No real adult role models. Would you want your culture defined solely by adolescents? 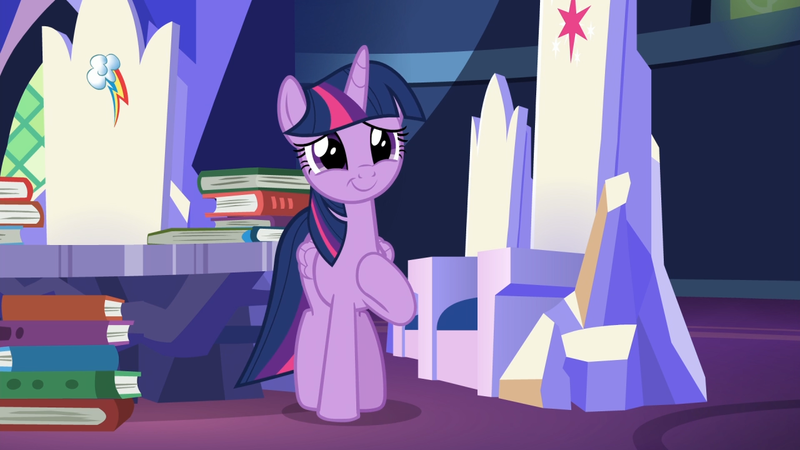 But supportive Twilight is cutest Twilight. She's willing to stomach this if it helps Spike. Though her earlier guilt may be an influence. I don't think I'll ever get over the sheer size of this castle that has only three residents. Given Sludge's voice, I wasn't sure about a musical number. But the drum beats and the more "talk to sing" style really helped. I'm afraid it can't stand tall after Autumn Breeze's number last week, but it's fun. You know what's weird about this? The multiple book colors make the library more lively. I enjoy it more than the usual blue tones. Are those robes just for Spike? Dude likes to accessorize! What's that? 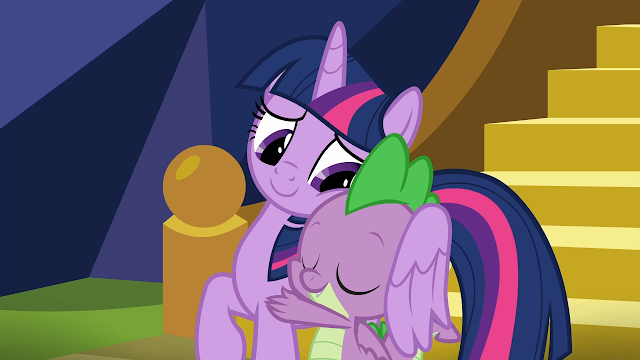 An adorable photo isn't enough Starlight Glimmer? You want more? You want to see her unhappy? Congratulations! 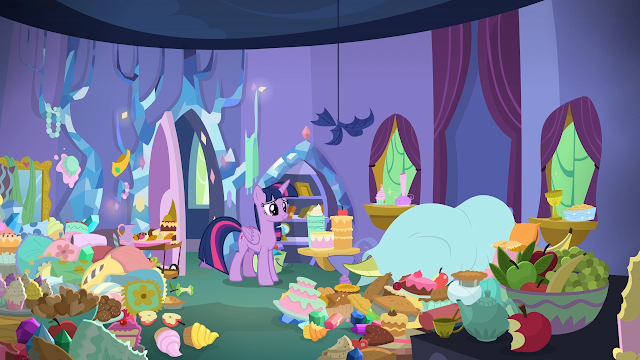 A cameo that gives us more Starlight, but she's none too happy! 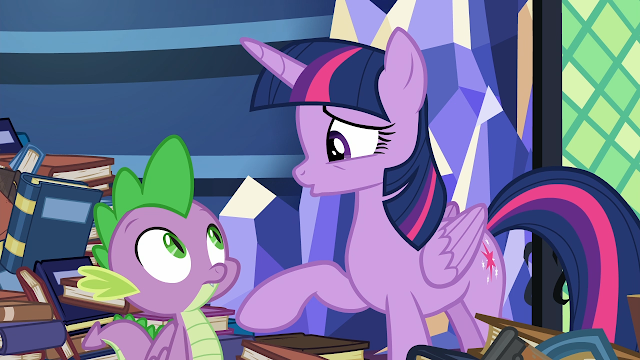 "Listen, Spike. Everywhere the light touches is a place we can freeload." I have not seen teeth that bad since Austin Powers. The good movies. Hmm... bad teeth = good movies? If I saw a dragon strutting that way towards me, I don't think I'd be afraid for the right reasons. 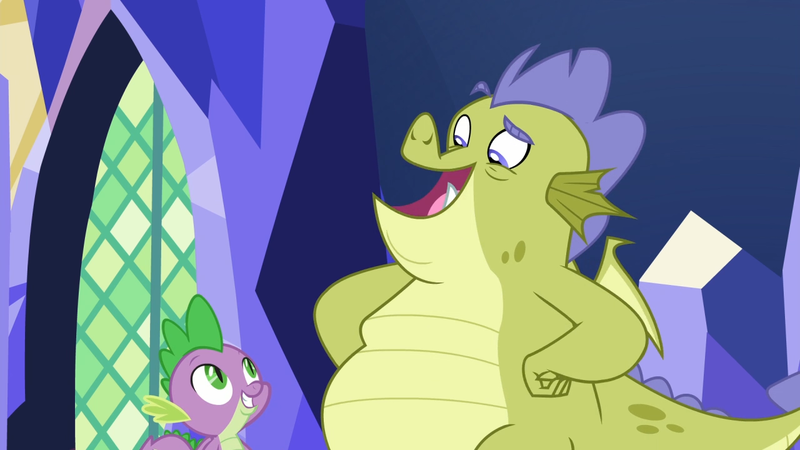 Spike is being oblivious, but he's so smitten with having a connection that I can't fault him. One can argue that he already rejected dragon perspective back in Dragon Quest, but life's changed since then. Ember opened up the possibility of real communication. 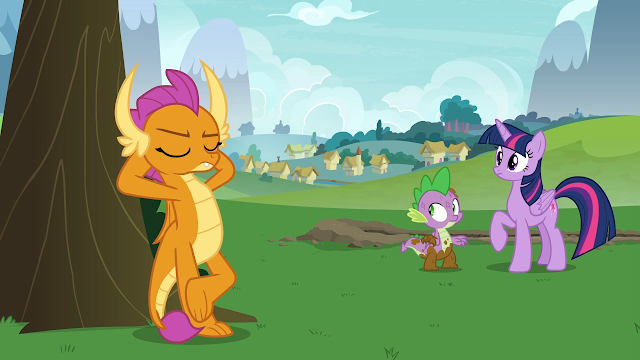 Smolder shows that he can forge connections. 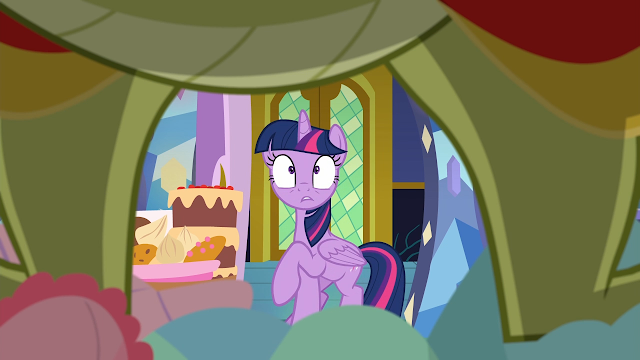 Twilight, run. Please run. Now. Yes. Please. 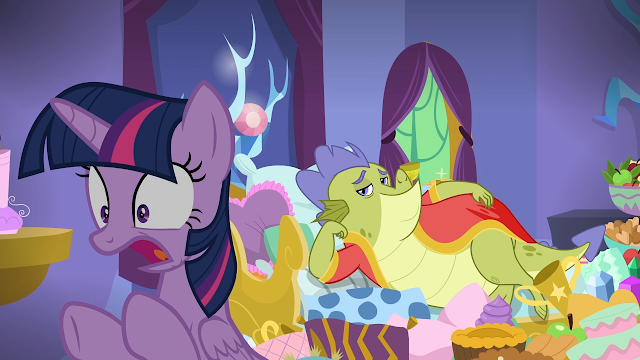 "Now Princess Twilight, draw me like one of your French mares!" "Okay, that's in my brain now." 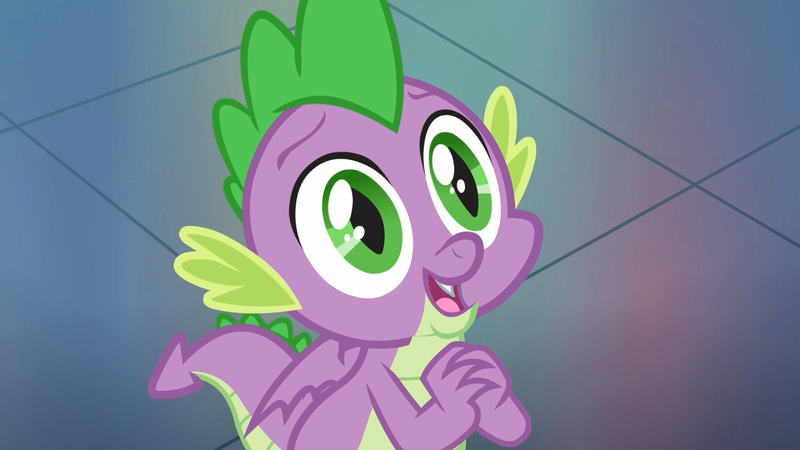 Spike! What a surprise! 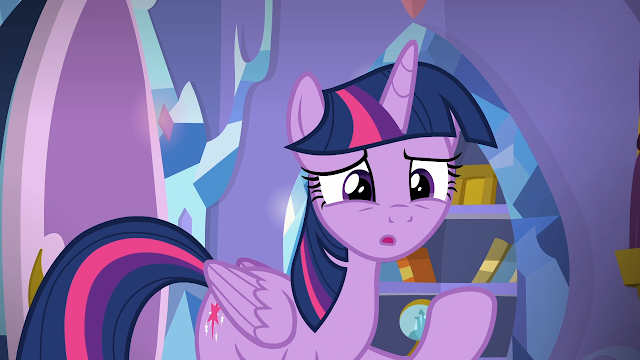 Twilight was just on her way to look up a brain bleaching spell. Have you had a chance to reorganize the library? "...And that's why I thought we could use the map to—"
We will never know her plan. 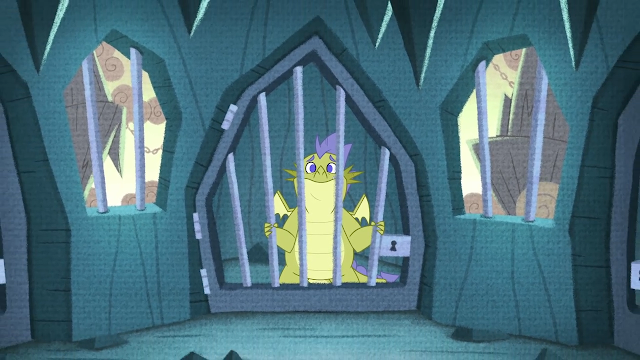 I'd like to think that Twilight wanted to use the map to find this place where Sludge claims he was held prisoner. As it is, the ponies never become proactive in exposing the truth. 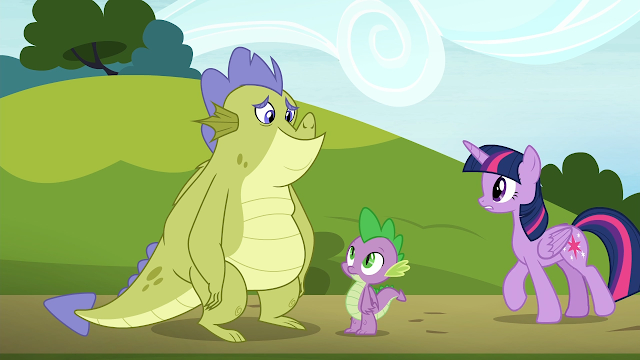 After all they did to help Spike and Sludge bond, it's weird that they all but drop out. Of course, I wouldn't want to use the map either after seeing this. Not without some disinfectant. 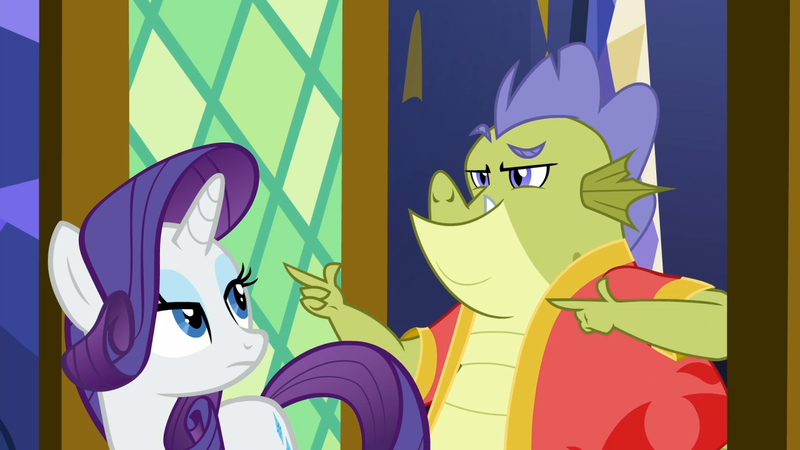 I think Rarity is an excellent proxy for the audience. But this is the last we'll see of her. Shine on, you fabulous fashionista! Now Twilight does try to intervene, but it's a Catch 22. I don't know how she could reason with Spike. Dragon culture is so unknown that she hasn't ground to stand upon. Any critique she offers will be seen as a slight against dragonkind. And that's just what happens. 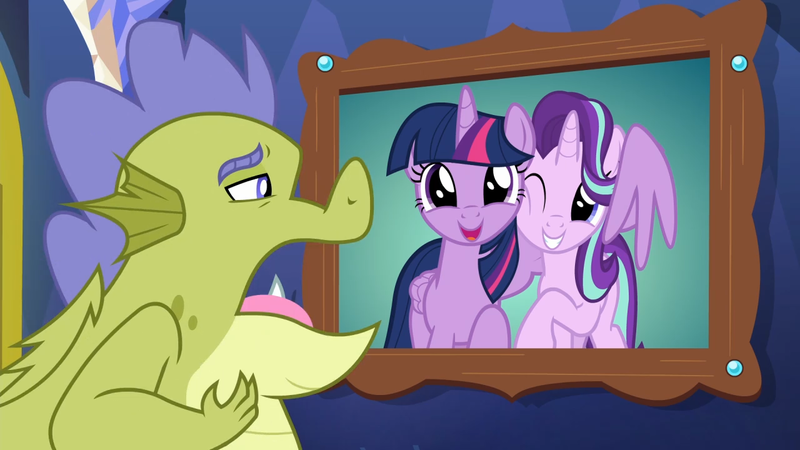 If only Equestria villains knew how easily one being could break Twilight's heart. Spike would be their first recruit. 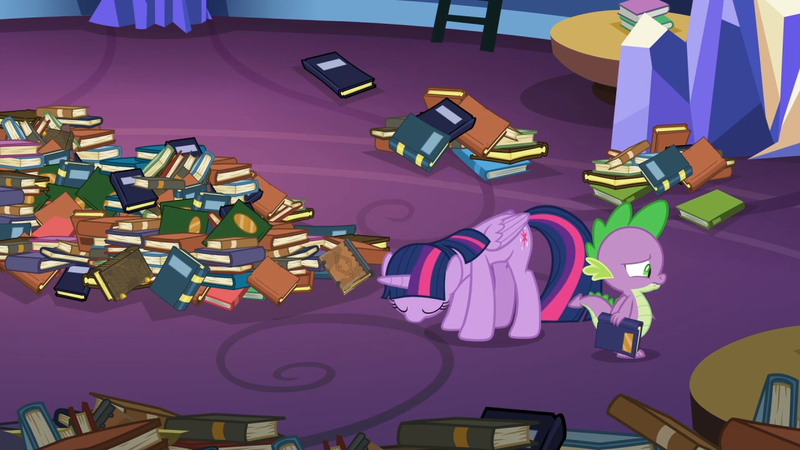 But though she holds her head low, Twilight has done more than she thinks. An idea is like a splinter. Once in our awareness, however small, it can affect how we see things. 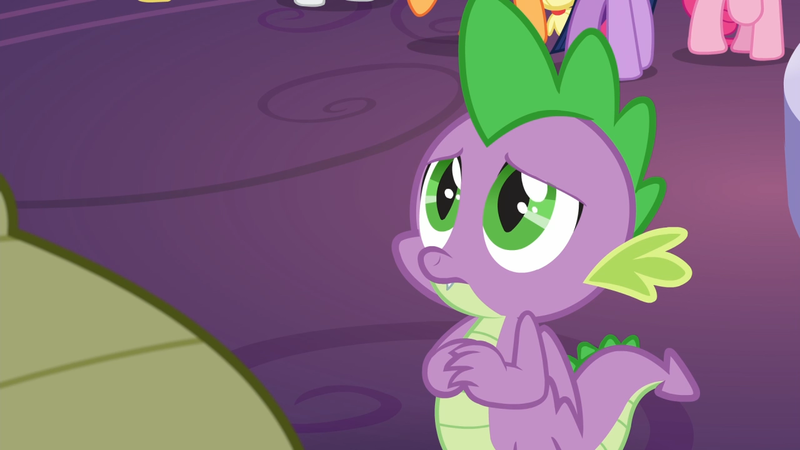 Spike has a question now, and rather than go ask Sludge he heads off to be alone. That is probably the best thing that could happen. 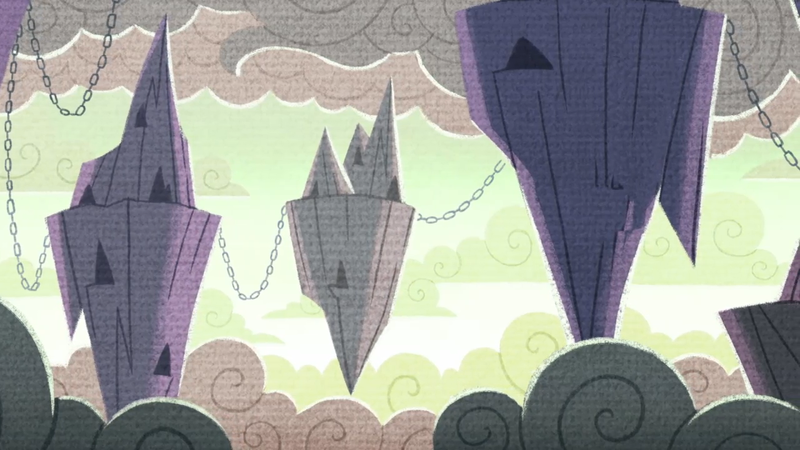 Again I must ask why the Castle of Friendship is so under-populated. You wouldn't need dorms for the School. Just let the students be supervised within the castle walls. The only sensitive areas is the map room, and that's already been defiled! Thank you for being here, Smolder. You are rising in my opinion of favorite students. It's a tossup because just about every creature has had a chance to shine... except Sandbar. Let Sandbar do something! 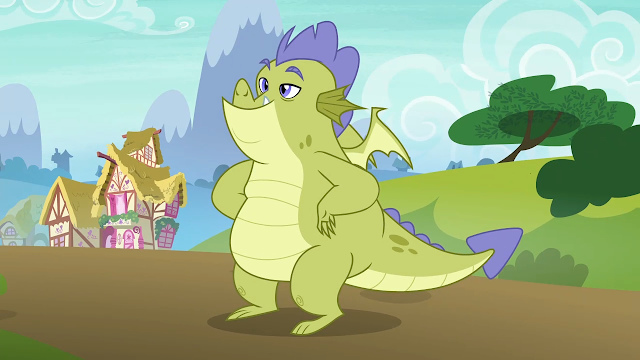 "Uh, dragons are rude and rebellious, but they aren't lazy lumps who take advantage of their kids"
Pulled in two directions here. 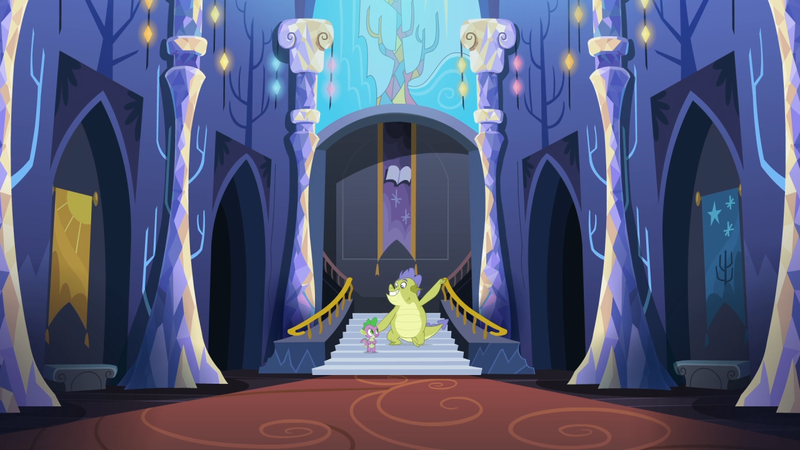 A firm stand that dragons do have morals, even if they have exceptions. Yet I've never heard a culture say, "We enjoy being jerks." It'd be interesting if the philosophy was "Earn your own way in life." "Kneel to no one." "Strength decides all." Ideas like that would really flesh out the dragon worldview and explain some of their actions. 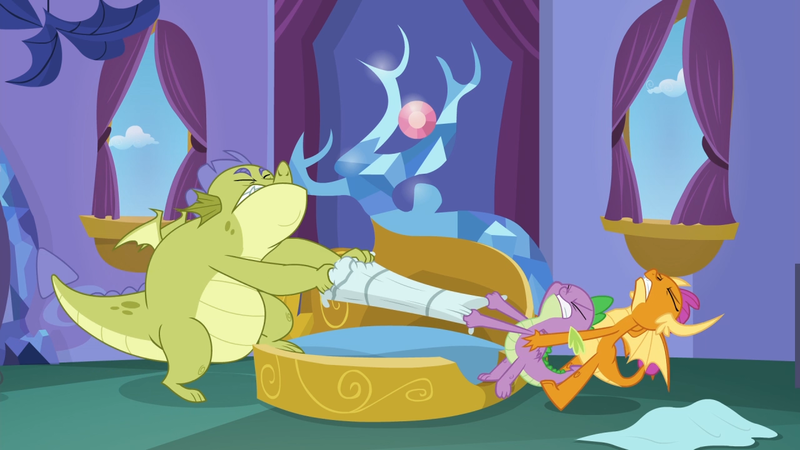 So in the end it's the words of another dragon that get Spike to lay the trap. Evicting a freeloader via psychological warfare. A shame the ponies couldn't chip in at Smolder's request. But now the secret is out. Long suspected and finally confirmed. Sludge is not the father. 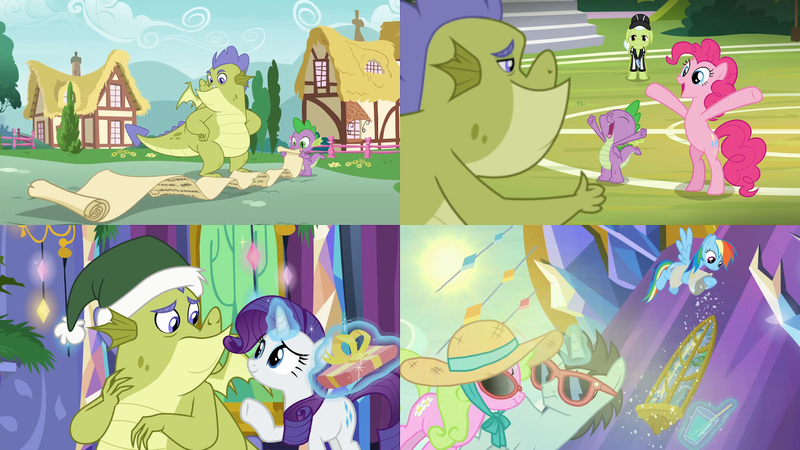 Likely, he concocted this plan after the ponies nursed him back to health. 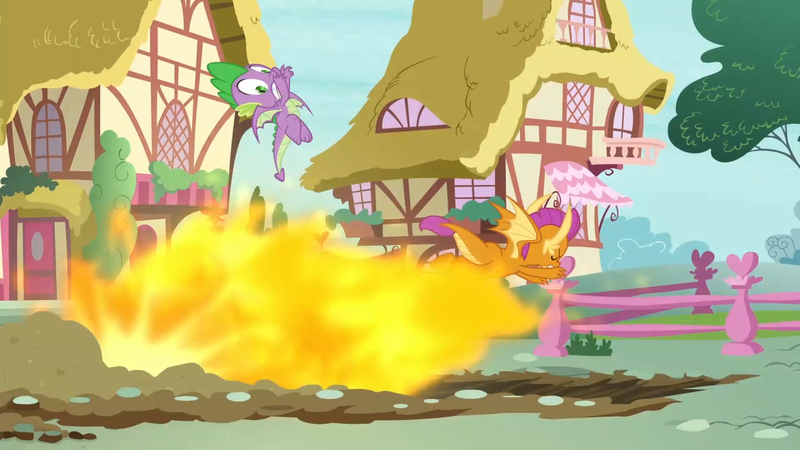 Which begs the question, why was he falling towards Ponyville in a fireball? He doesn't strike me as a guy who would intentionally endure short-term pain for a scam. And those eyes are going to haunt Sludge for the rest of his life. 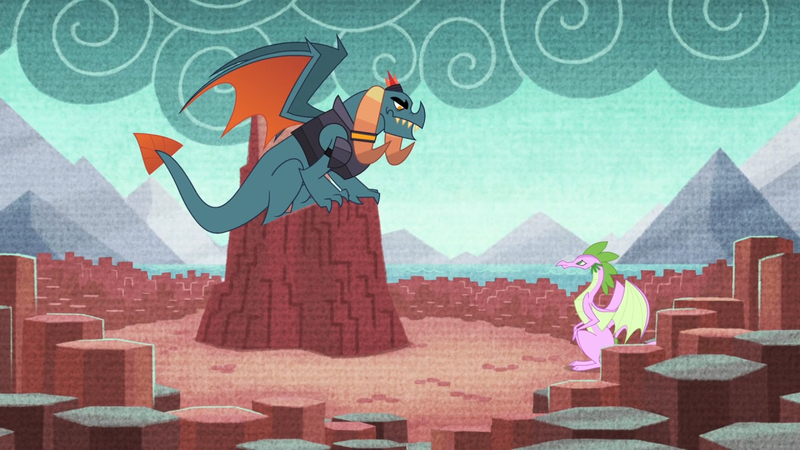 Sludge and Ember stand on opposite sides of what it means to be a dragon. One is about opportunity and greed. The other is about attitude and loyalty. It's tempting in fantasy and science fiction to portray a species under a mono-culture. Getting to see Sludge and Smolder argue is a great way to show that simply being born a dragon doesn't mean everyone agrees on what that means. Sure, take that pillow. I can tell you where to shove it. But maybe this isn't a complete washout. 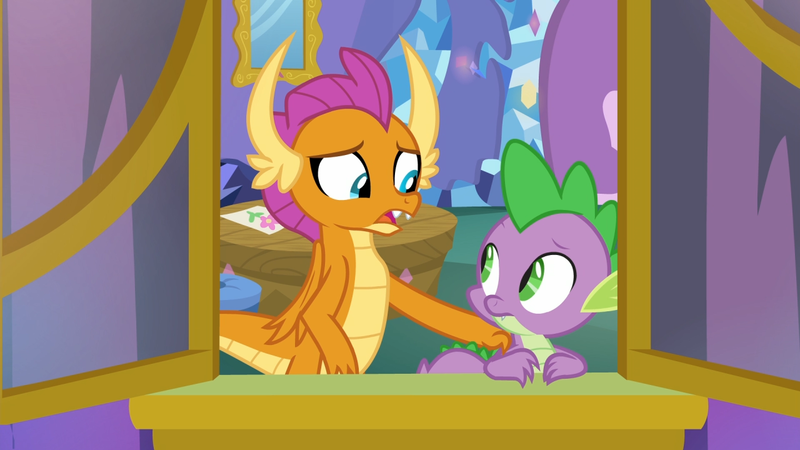 Smolder and Spike have bonded and Smolder now understands some of what Spike has had to face. I hope their friendship will deepen. Oh, but this wonderful reconciliation. 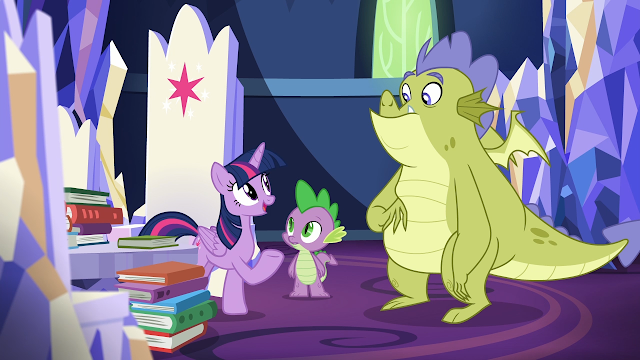 Spike's role in the show started as Twilight's assistant. But now I truly see him as a family member. Little brother, most likely. And that's Father Knows Beast. 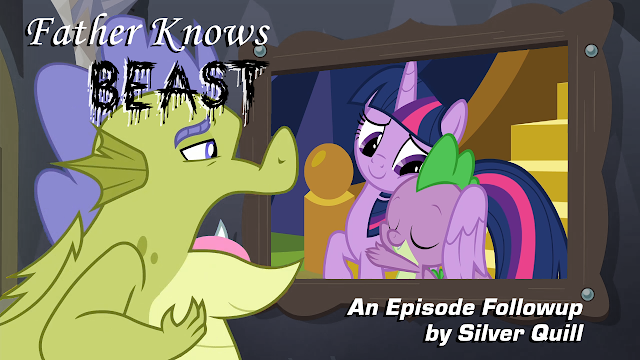 It's a fun episode with some very emotional moments. 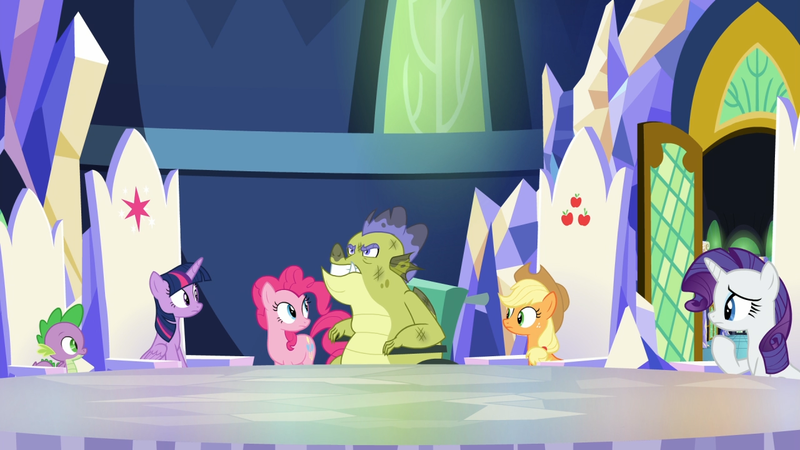 Spike gets to take center stage once again without creating his own problem. 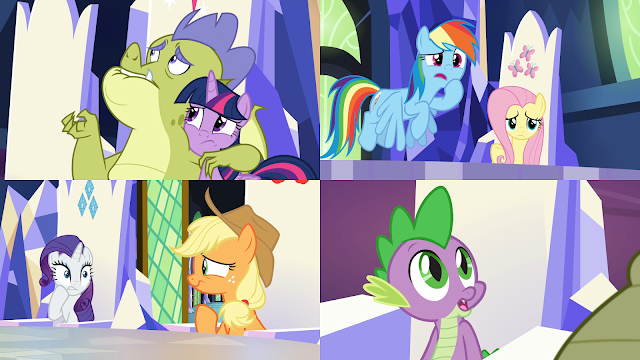 The Mane Six are helpful and supportive, but disappear right when Spike would need them most. 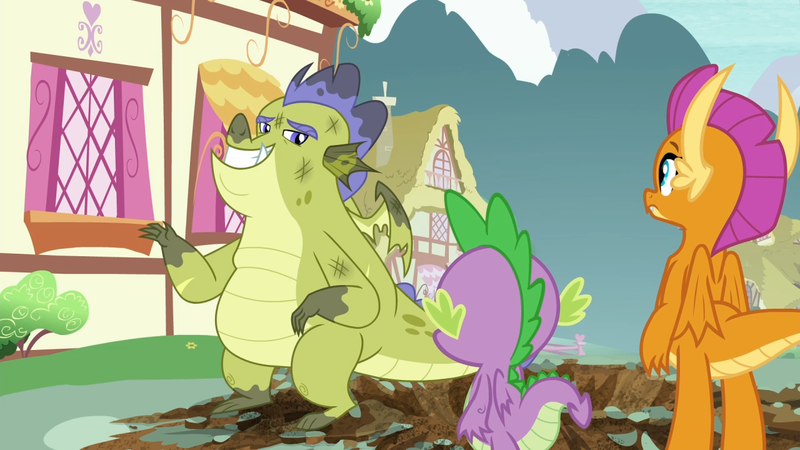 Thank goodness for Smolder and her role in exposing the lie. I do wish Sludge could have become a mentor. 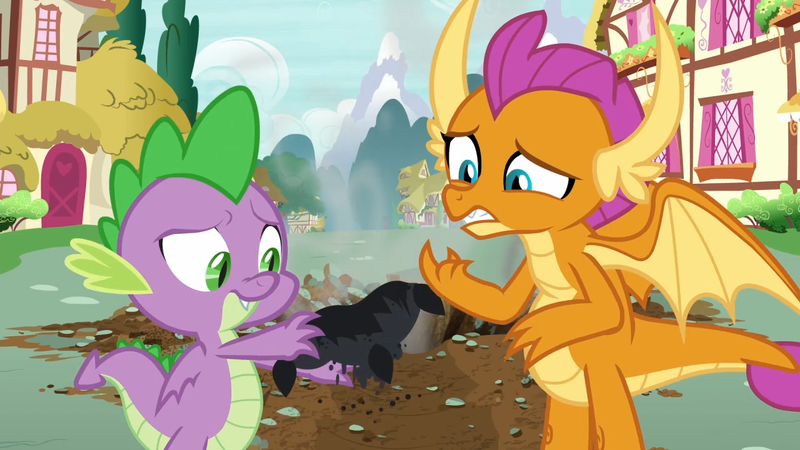 Show Spike that he's fine just the way he is, but if he ever had a question about growing up a dragon then Sludge would be there whenever needed. As it is, Sludge's greatest punishment is that he can never be more. He had a chance and lost it, even if he is unaware. 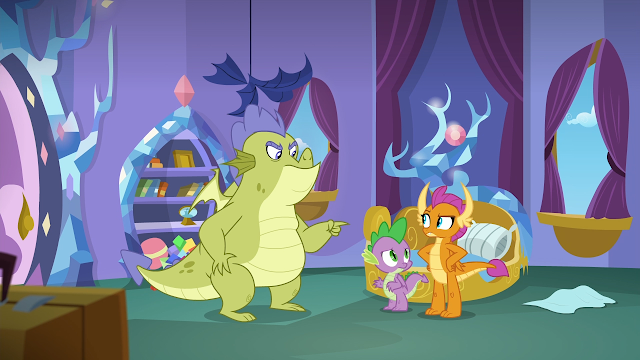 Gauntlet of Fire remains my favorite Spike episode. But this episode is pretty high up there for the little guy. 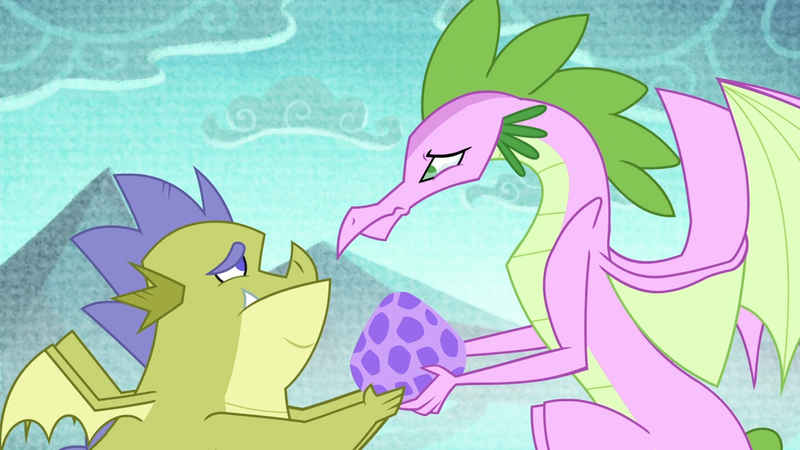 Hopefully Spike can still see a positive side to dragon culture even though he already know who he is and who he wants to be.